Empty space can be an invitation. Whether space in time or a physical place, emptiness invites creation - a making of something where there was nothing. There is a creative act in the filling of emptiness; I like to call it Spacecraft. The past year of my life has been one of fluidity. There is less predictability, schedule, and set expectations, than in other seasons, so that leaves a lot of empty space to be filled and it's up to me to decide how to fill it. Who to be, what to do? These are big questions. I keep finding myself saying I want to, "create spaces for people to access their own wisdom." I just keep saying that and so there must be something Real in it. Surely, I must listen to myself and surely there must be wisdom in something that seems to keep bubbling up from a place deep inside. Here are a few of the spaces I've filled or I'm working to fill, all exciting and touching on a purpose I can't quite pinpoint and say, "This right here is who I am and what I do." All I can really say is, "I'm starting to specialize in Spacecraft." There is a week in July that a friend and I decided to use to bring people together across continents and across religious divides to form lasting friendships. We meet each week to decide how to best fill this week and we're quite certain it's going to be a special time. Find out more at The Unity Initiative website. Nonprofit organizations in the region are giving me spaces in their annual staff retreats or within their work days to lead workshops on staff care and soul care. Emotional and spiritual burnout is a common issue for those working to improve the lives of others; we can't give what we do not have and we cannot help when we are cynical and stressed. This has become an issue I love working on and one that needs addressing. I'm also consulting individuals who are taking a personal retreat and need ideas on how to best fill their time to make it meaningful and leave them feeling full again. This is all a lot of fun for me. Last year, I worked with a team to host 200 people from this region and around the world to come together and learn how the teachings of Jesus are not Christian, but radically relevant to us all and a point of unity across the divides in our world. My specialty was in organizing the small groups and craft how people from all different backgrounds would get to know one another deeply within a few days. It was my dream assignment. Last year, we crafted a rooftop jungalow addition to our home. An empty rooftop is now a treasured Space for the Special. There is a piece of land right on the Nile River, only a few kilometers from where this longest river in the world begins its journey. A vision is slowly forming around this family property and we've had the fun privilege to share in its creation. A beautiful home is nearing completion and we hope to use this space to serve others well for rest, fun, and soul-searching. Last year I began The Living School and I'm working to be more consistent in my spiritual practice alongside motherhood. It launched me into a journey of questioning whether it's possible to be both a mother and a contemplative. After all, there aren't many role models out there who bridge those two worlds. After thinking about this for over year and talking to several other women, I started on online space to expand this conversation. Do let me know if you're interested in exploring the topic of "Motherhood as Spiritual Practice" with me. When I was an expecting mother, a friend threw a birthing blessingway for me and it was one of the most treasured ceremonies ever thrown for me. This friend is quite gifted in leading rituals and blessings and she taught me (possibly without knowing it) the incredible beauty of honoring time, honoring seasons of life, and bringing a community together to bless an individual facing a transition. The space she created for me, with women who knew me intimately and loved me well, was indeed a blessing. 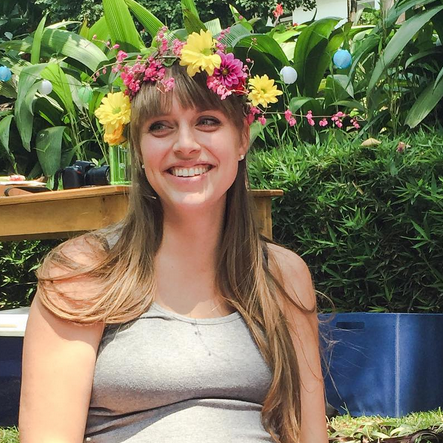 My friend left Uganda a couple of years ago, and I have tried to fill the gap she left in our community by hosting birthing blessingways for other expecting mothers. Now, this ceremony has become absolutely sacred to me and is always a time I feel a great sense of Connection. In no other ceremony do I feel as many goosebumps trickle up and down my arms as I do when I am with a group of women who surround a creator of life and honor her coming transition, honor her body, honor her excitements and her anxieties. The spirit created in these circles of women is beyond expression and it has truly become the most sacred ritual I take part in. Below, I share some suggestions for hosting a birthing blessingway for an expecting mother in your life. When done with a spirit of reverence and community, I know it will bless all who attend. A birthing blessingway is quite different from a baby shower. Gifts are not necessary, although they can be incorporated if the host or the mother wishes. Rather, this gathering has an emphasis on emotional and spiritual support for the expecting mother by those women who are closest to her. It is not a gathering for the whole family and all of her friends, but rather a gathering of the women in her life from whom she feels the greatest love and support. It is important that the mother make the guest list herself. Preferably, it should be a rather short list to make for a more intimate gathering. It is also best not to incorporate time for guests to dole out advice for the mother. Chances are, she's already overwhelmed by the unsolicited advice she has received from everyone else. Encourage this to be a time of simply listening to and validating the mother. It can be hard to hold our tongues with advice we want to give because we want to "help" our friends, but encourage guests to notice if the advice will truly serve the mother or if it might be coming from a place of making the advice-giver feel better about their own motherhood knowledge. This can be a tricky line to draw, but it is one that encourages mindfulness in our interactions with women bearing life and facing many emotions. Ask guests to write a blessing to the mother before the ceremony, which they will read aloud. In this blessing, they can include characteristics they see in her that will make her a great mother, what they will pray for, and what they wish for her, etc! If you would like, you can ask the guests to arrive earlier than the expecting mother and when the mother arrives, the host can blindfold her and lead her through a line of women, who will each hold her hand and read their blessing to her one-by-one. Collect the cards and papers these blessings were written on and give them to the mother. Invite guests to bring a bead with them to the ceremony that reminds them of the expecting mother or represents a blessing they would like to give to her. For example: "This is a red bead and red is a strong, bold color. You are one of the strongest women I know and your boldness will serve you well in motherhood." Each woman will give their bead and their explanation of it to the mother. String these beads together for the mother to have with her during labor to remind her of all the women standing with her and to squeeze in her hands during a contraction! When guests have been seated, go around the circle and have them introduce themselves through their maternal heritage as far back as they remember. (You may want to give them a heads up on this so they can look it up before coming!) For example: My name is Dani and I am the mother of Leo, the daughter of Ruby, the granddaughter of Ruby, and the great-granddaughter of Blanche. While each women introduces herself, pass around flowers and a piece of ribbon. Each woman should wrap the flowers in the ribbon during her introduction, adding to each other with each woman to eventually make a flower crown. At the end of the introductions, crown the expecting mother! If the guests did not read their blessings to the mother as she entered the gathering, you can go around the circle again and do this. Perhaps you can provide a ribbon that each woman wraps around her wrist after reading her blessing. When all the guests have finished, note how the ribbon literally ties all the women together and remind the mother that all these women are here for her during this season of life. You can then pass around a pair of scissors to cut the ribbon so that each woman can tie it around her wrist as a reminder to pray for the mother. Provide a time for the mother to share about anything on her heart and mind regarding the coming baby and birth. Invite her to share her excitements, fears, and emotions about anything from the changing relationship with her partner and other children to finances or the birth itself. Encourage the guests to listen well to the mother without interjecting pieces of advice. Don't rush this time - the mother may find herself processing emotions she has not had the time or space to acknowledge. While the mother is speaking, one woman (or multiple women!) could draw a henna mandala tattoo on the mother's belly! Say a final blessing or prayer over the mother. This can be done by "anointing" her belly with oil - perhaps a special essential oil. Do you know a mother you would like to bless, but you live far from her? Throw her a blessingway from a distance! Ask her for the contacts of her closest female friends and invite her to write out her thoughts and emotions about the birth and baby. Share her thoughts with these women and ask them to send the mother a card with a written blessing, as well as a bead, as explained above. It is sure to encourage her and remind her of the women in her life who will support her through this time. Here I am at my blessingway, surrounded by very special women and feeling more than blessed. I do, however, acknowledge that I look more hippie than ever with my flower crown, labor beads around my neck, henna belly tattoo, and rainbow California shirt! Ha! The idea is simple - host a small group to discuss a certain topic or idea with collected quotations as a guide while sharing a meal together around a table. Just last month, we hosted Dinner and Mystery, chatting with special friends about engaging the Unknown and why it is important, about letting ourselves be taken by Wonder and what that does for us. Now, Mystery and Wonder are some of my very favorite topics and have are becoming the foundation of my seeing. Indeed, it is the reason for the name of this blog. There is much to say about these topics, but I will let the sampling of quotes that I found lead to you wonder about mystery better than I can. But if I can add just a little observation, I'll point out that the many wise words on wonder so often point to two things to help nurture it in your life - nature and children. What nurtures a sense of awe in you? “Our investigation indicates that awe, although often fleeting and hard to describe, serves a vital social function. By diminishing the emphasis on the individual self, awe may encourage people to forgo strict self-interest to improve the welfare of others. When experiencing awe, you may not, egocentrically speaking, feel like you're at the center of the world anymore. By shifting attention toward larger entities and diminishing the emphasis on the individual self, we reasoned that awe would trigger tendencies to engage in prosocial behaviors that may be costly for you but that benefit and help others.